/ Ask a Dairy Farmer / General / How can I identify Canadian milk? How can I identify Canadian milk? Thank you for choosing to support Canadian farmers! Look for one of our two quality milk logos on the packaging. These logos indicate that the product is 100% Canadian. 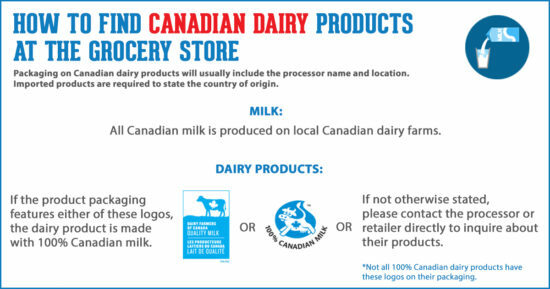 It is the choice of the processors whether or not to use the logo, so we recommend contacting them directly to confirm if their product is 100% Canadian if it does not have the symbol. Remember, the milk currently coming in and the will be entering Canada from the CUSMA from other countries does not have to meet our quality standards. An example is that added synthetic hormones are completely illegal in our Canadian cows, while it’s legal elsewhere. Learn more about Canadian quality milk. I can’t find the 100% Canadian Milk symbol on some of my favourite dairy products. Are they still Canadian? How can I ensure that I purchase dairy products than come from local farmers and not factories?